President Barack Obama’s recently announced initiative Computer Science for All is a call from the highest office that computer science education is important for the future of the nation. CS education is important for all children in the modern era, for sure, but it is essential for students of color, especially black and Hispanic students in the 21st century. Their ability to engage in the workforce and to confront the pressing problems of the world will hinge on their ability to use and adapt computation to their own ends. That does not mean that they have to be advanced computer programmers or software developers while in grade school. 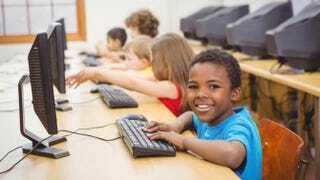 It means that, at a minimum, they must have the logical and analytical skills necessary to engage in computational thinking. With that foundation, they can make better use of the array of science, technology, engineering and math programs, coding camps and hackathons that are increasingly marketed toward them. More important, it sets them up to utilize computation as a tool in whatever field of study they pursue. It is a perfect entry point to postsecondary life in the modern world. There is an increasing concentration of students of color in U.S. public schools. According to the NCES (pdf), U.S. public schools have reached an inflection point where the proportion of students of color is growing at the same time that the proportion of white students is declining. In California, for example, there are twice as many Hispanic people under age 18 than there are white young people. This demographic shift is tragically linked to an income shift. According to the Southern Education Foundation, more than half of all public school students in U.S. cities are from low-income households. They are poor. The juxtaposition of race and class continues to confound education leaders and benefit or penalize children based on where they fall on the spectra—black to white, rich to poor. With the increasing concentration of both students of color and poverty in the public school system, the challenges to achieving universal success in mathematics, English-language arts and social studies remain significant. Students of color cannot wait until the achievement gap in mathematics, for example, is closed before district leaders commit to meaningful computer science education in primary and secondary school. In Atlanta, the proverbial black mecca, 11 percent of black students were proficient in mathematics in the eighth grade, compared with 79 percent of white students, in 2015, according to the National Center for Education Statistics (pdf). In Chicago the proficiency rates were 11 and 72 percent respectively. This is in the context of Atlanta and Chicago being the two most diverse and most segregated cities in the United States. Residential segregation is a driver increasing racial segregation in public schools. That trend is continuing unabated across the country, and the achievement gap is yawning alongside it. Waiting for a universal closure of academic achievement gaps is tantamount to waiting for a utopian American society. Our students can’t wait that long. There is hope. Cities like Chicago and New York have made CS education a priority. The president’s call has charged federal agencies like the National Science Foundation and the Department of Education to sharpen their focus on understanding the most effective ways of making this charge viable. There is a groundswell of organizations and community voices pushing for innovation that will expose and incorporate quality CS education into the lives of young black and Hispanic students. Infusing computer science education is not just about adding a new tested subject to the overflowing cup of standardized tests. It is also about utilizing creative ways of engaging computation in the service of math and science education. It means coordinating the endless array of out-of-school programs for coding and hackathons so that they serve as complements to students’ core education. This work is difficult but doable, and our students cannot wait. Kamau Bobb, Ph.D., is a program officer in the Directorate for Computer & Information Science & Engineering at the National Science Foundation. He is on rotation from Georgia Tech. Follow him on Twitter.